Free shuttle every 30-45 minutes! 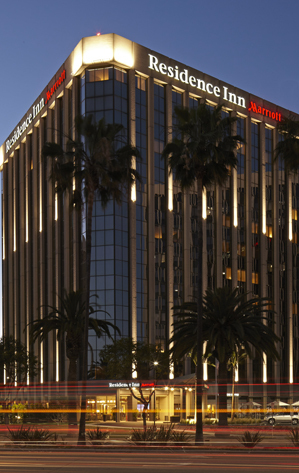 The Residence Inn by Marriott Los Angeles LAX/Century Boulevard offers contemporary comforts and genuine hospitality less than half a mile from Los Angeles International Airport. Our 231 stylish suites are the largest among LAX hotels, and boast a full kitchen with microwave, full-size refrigerator, stovetop and cookware in addition to King or Queen beds, spacious work areas, and 47" flat-screen TVs with HD programming. Take a video tour of the hotel! 2018 Tripadvisor Certificate of Excellence winner! Leisure travelers, business guests and families staying at the Residence Inn Marriott LAX will also enjoy a variety of complimentary amenities including a hot breakfast each morning, Wi-Fi access throughout the hotel and 24-hour shuttle service* to and from the airport running continuously every 30-45 minutes. From our fitness center and outdoor heated pool to contemporary meeting space, it’s easy to see why our all-suite retreat is a stand-out destination among LAX hotels. Planning an extended trip to Los Angeles? The Residence Inn by Marriott Los Angeles LAX is one of the closest extended stay hotels to LAX airport, while just a short drive from El Segundo, the South Bay, Santa Monica, Venice Beach, Downtown LA and Hollywood. Residence Inn by Marriott Los Angeles LAX/Century Blvd. is a proud member of the Marriott Bonvoy travel program. Reserve your stay today at our all-suite Los Angeles Hotel! * When you exit the LAX terminals, look for the red station marked "HOTEL SHUTTLES." Our shuttles are yellow, marked with the hotel logo in the window, and are shared with Airport Center Express and the Embassy Suites LAX North. The Residence Inn LAX is a Seaview Investors hotel. Discover this brand new, all-suite hotel which offers contemporary comforts and genuine hospitality less than half a mile from the LAX Airport. The perfect place for weekend getaways and extended stays in Los Angeles.